Dunbar and Boardman: Where is the Highest Escalator in the World? Where is the Highest Escalator in the World? There are many impressive examples of vertical transportation all around the world. We have placed a spotlight on many of them with our blog posts. In this post we turn our attention to the highest escalator in the world. The highest escalator in the world is actually one of a pair of escalators. The location of these escalators is as far removed from standard installations of linear escalators as you can imagine. The highest escalator in the world is in Japan at the Sky Building located in the Umeda district of Kita-ku, Osaka, Japan. 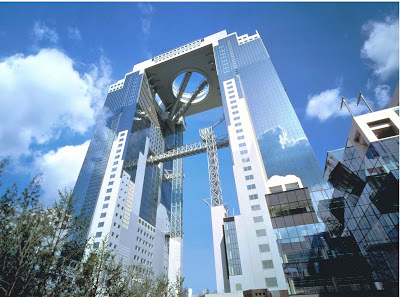 The Sky Building is Osaka’s seventh tallest building and got its name because of its height; the building consists of two 40 story towers rising 173 metres (568 ft) from the ground. A pair of escalators bisects a circular atrium piercing the roof and upper levels of the building. These two escalators are the highest escalators in the world. The building was originally planned in 1988; it was to be the “City of Air” project and there were to be four interconnected towers. Costs for this project prohibitive and four buildings were subsequently scaled down to two. The scaled down building with two towers was designed by Hiroshi Hara and was constructed by the Takenaka Corporation. Construction was completed in 1993. The building has a rooftop observatory, a floating garden observatory and an underground market. At the bottom of the towers there is an urban garden with walking trails and water features. The Toshiba Corporation wholly owned the building until in July 2008 they sold a majority stake (65%) to Nomura Real Estate. They retained 35% ownership. Tenants of the Sky Building include Mazda, the Consulate General of Germany and Astra Zeneca. It is possible to pay a small fee of 700 yen to ride the glass elevator to the top of the Sky Building and then to experience the highest escalators in the world first hand. Dunbar and Boardman is the lift, escalator and access equipment consultancy. Are you currently planning a project that will involve vertical transportation? We would be happy to discuss with you. Give us a call on T +44 (0) 20 7739 5093 or send us an email via garyavis@dunbarboardman.com to start the conversation. We look forward to hearing from you. Your blog improves my knowledge about highest escalator in the world.Dr Andrew Unterweger is a specialist person in this field. If you have any problem, you can contact with him. Who built the Medellín Escalator?